Metro DC Lawn and Garden Blog: New gardening product – Is it Good or Bad for the environment? I am searching for the same answers...would love to know if this really works. Oxygenated water opens up the plant's root system which better enables it to take in the vital nutrients from the surrounding soil thus eliminating the need for chemicals. 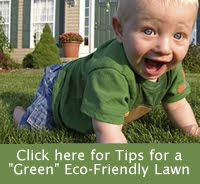 By making grass stronger it helps to block out weed growth so makes your lawn lush. Water from rain barrels has some benefits but it quickly loses the oxygen from the rain which is what lawns and plants love. For water savings, you can water your grass once per week giving it a good soaking which allows the roots to grow deep and strong. Watering more frequently creates shallow less healthy roots. I don't use any chemicals for my lawn, I just cut it regularly and it grows faster. Sometimes it's better to do nothing in order not to harm the environment.